Home health can offer amazing flexibility and freedom, but proper time management becomes imperative as a home health SLP. When I discovered home health, making the switch was easy. I was given a flexible schedule and hours, and I got the opportunity to self manage. What didn’t come easy for me was time management. 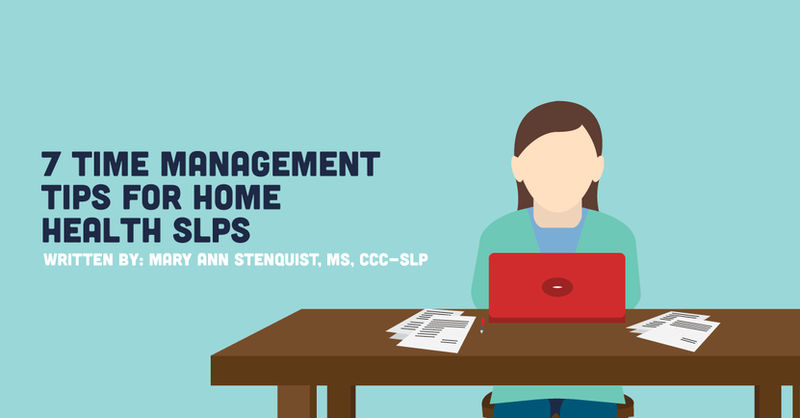 That’s why I wanted to provide a collection of tips on how to effectively manage your time as an SLP in home health, both during and outside of a session. Part of our job as SLPs in home health is assessing our patients’ well-being and taking vitals. I always assess vitals in the first five to ten minutes of arriving in the home. It's tempting to jump right into our treatment plan; however, if the patient’s vitals are out of whack, we could be wasting precious time and energy. For example, I had a patient that had extremely high blood pressure readings, so I had to adjust our plan for the day. Because it was at the beginning of the treatment session, I was able to call the patient’s doctor, get recommendations to relay to the patient, and educate the patient and their family. Had I done vitals at the end of the visit, I would have felt rushed and might not have been as thorough. We must make sure our patients' well-being is our top priority. We are viewed by the patient and their family as the medical professional in their home, and we are expected to act in case of a change of status or in an emergency. So, whether you're married or single; have kids or not; patients are human too, and they will respect your time just like you respect theirs. Ask for the patient’s permission to ensure they are okay with you staying to document in the home. Something I discovered rather quickly was the importance of keeping a physical copy of my time record in my car. I found it best to record my time in and out as soon as I got into the car. It only takes a minute or two and will save you later on! I started tracking mileage by myself, but I found that I wasn’t accurate or consistent, and mileage (and potential reimbursements) were lost. I came across a suggestion from an SLP home health group to get an automated mileage tracking app called MileIQ. Not only does this save time, but it also keeps track of your mileage so you don’t have to! An automated mileage tracker is perfect for mileage reimbursement for your employer and can be so helpful come tax time should you need to file mileage reimbursement for tax deduction purposes. No matter what method you use, be consistent in recording your mileage and your hours. It will be fresh in your mind, and it will save you at least 20-30 minutes of backtracking later. I know you think you will remember your week, but trust me, it will become a blur. As SLPs we teach cognitive strategies for memory, including writing things down. It’s time we practice what we preach! In this field communication is key, and this is even truer in the home health setting. Unlike in an SNF or hospital setting where there are nurses, case managers, and physicians to talk to in-person, you do not always have this available to you in home health. It becomes all the more crucial to communicate your plan of care and observations to a patient’s team of caregivers via phone. I work for a contracting agency that receives referrals from multiple agencies. Because of this, there are multiple methods of accessing patient information: via tablet, company emails, secure portals, etc. It takes times to locate pertinent information in order to communicate with other providers. That is why I suggest making a patient quick reference sheet. This reference includes information such as patient name, date of birth, address, phone number, spouse name, and their MD's name and number. It makes it so easy when you are on the phone with other providers to read the information off of your handy quick sheet. Looking for a change in scenery? Check out some of the pros and cons of working as an outpatient SLP! A word of caution though: be conscientious as this is protected health information! Keep it in your hand or bag at all times, and lock your bag in your car when not in use. You may also have access to hands-free calling from your car. I recommend starting your call to the provider before you drive off. Then you can read off the name, DOB, and other information to them safely. It is not worth compromising safety to save time. Part of the roller coaster of home health is that it's feast or famine. Some weeks you won’t have time to catch a break while others you're twiddling your thumbs, waiting for a storm of referrals to come in. Regardless of when or how often they come, when you get a referral, even over on a weekend, I find it best to call and schedule the appointment immediately with the patient and/or family. Reaching out sooner means you’ll have more time to work together on finding a time that works. These are just a few of the many time management techniques you can learn slowly by working in the field or quickly by talking to other SLPs. You have to think outside the box to effectively manage your time and your caseload as an SLP in the home health setting. Regardless of the setting you find yourself in, time management skills apply throughout the field.